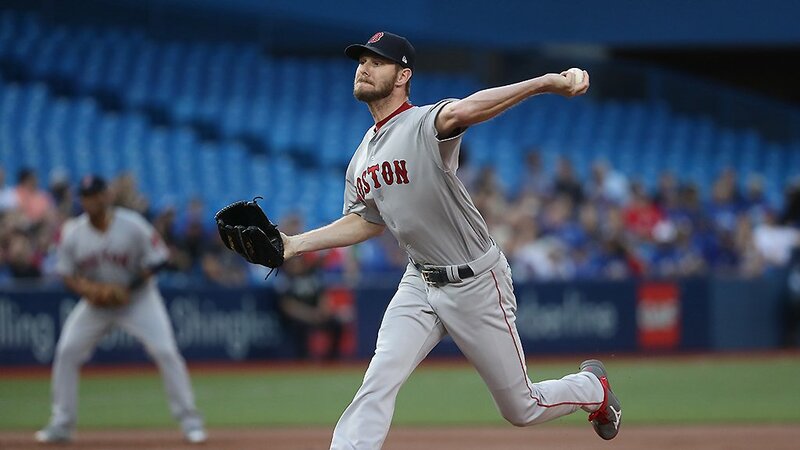 Chris Sale returned to dominant form for seven-plus innings and the Red Sox supplied enough runs to beat the Blue Jays 3-0 at Rogers Centre Tuesday night. Sale (pictured) was brilliant; at one point he retired seventeen straight Toronto hitters. He struck out eleven while allowing just three hits and not walking a batter. He also became the fastest to reach 1500 career strikeouts in MLB history. Boston scored single runs in the sixth through eighth innings. Eduardo Nunez doubled home a run in the sixth, Hanley Ramirez hit a solo home run in the seventh, and Andrew Benintendi drove in another with a single in the eighth. Addison Reed pitched out of a bases-loaded jam in the eighth; Craig Kimbrel scored his 31st save of the season by striking out two. The Red Sox stole five bases in the game. Rajai Davis, Nunez and Benintendi each had two hits for the Red Sox who increased their lead in the American League East to four games over the Yankees who were rained out in New York against Cleveland.